the fascination sylvia and i had with twins always ran deep. when we were little we pretended to be twins ourselves, but i'm not sure now if anybody ever believed us since our age difference of almost two years came with a significant enough size difference. it seems like most of our childhood was spent in matching handmades by our mom, which as you can imagine we didn't mind a bit! one of our alltime favorite stories had also been our mom's favorite read as a child: Hanni und Nanni (which is the german altered version on Enid Blyton's "St. Clare's"). we loved reading the books, listening to the audio cassettes, and playing that we're hanni and nanni – complete only with drawing freckles onto our faces to make us look more like them. naturally then, i was excited when at the end of last year i got to draw a custom portrait of these sweet twins here. i adore the look on their faces. to me it seems as if they're not so sure of what is going on, but as long as they are close together they'll be okay. if you would like to commission a custom portrait, please feel free to contact us! even if the portrait involves triplets or quadruplets - i'm up for a challenge! I will never ever tire seeing your drawing talent. 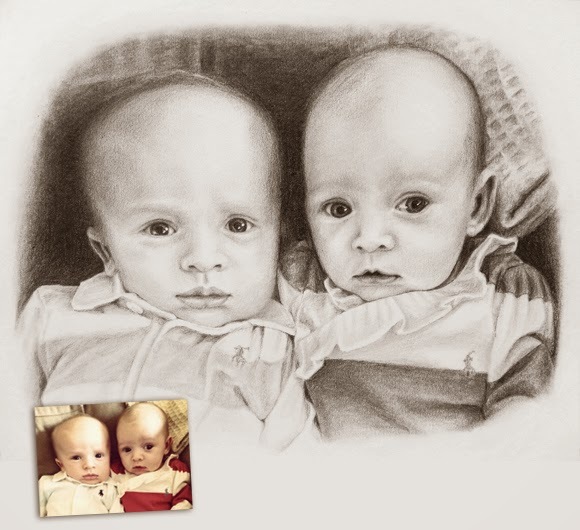 Love the drawing of the twins! !